Despite the broad spectrum of weather that was observed last year, the overall climate of 2014 can be summarized in one word: warm. 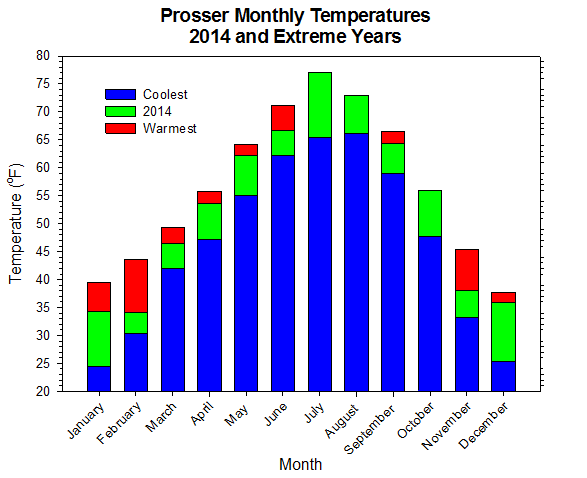 It was, in fact, Prosser's warmest year in at least a quarter-century. 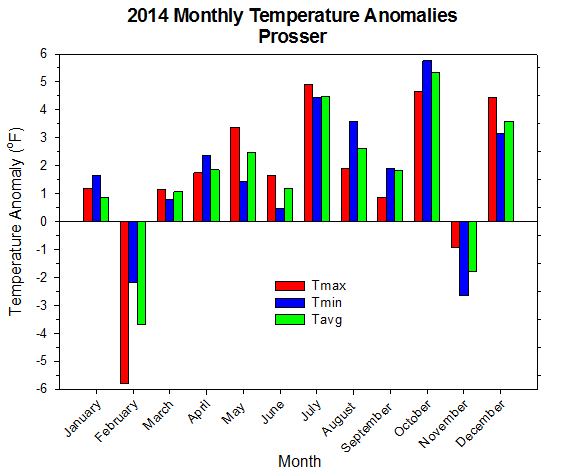 Although 2014 temperatures were fairly consistently above normal, one period stands out from the rest. 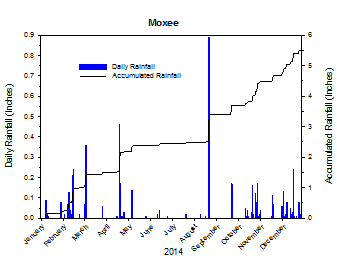 The mid to late portion of the growing season was an unusual and record-breaking time frame of seemingly unrelenting heat. 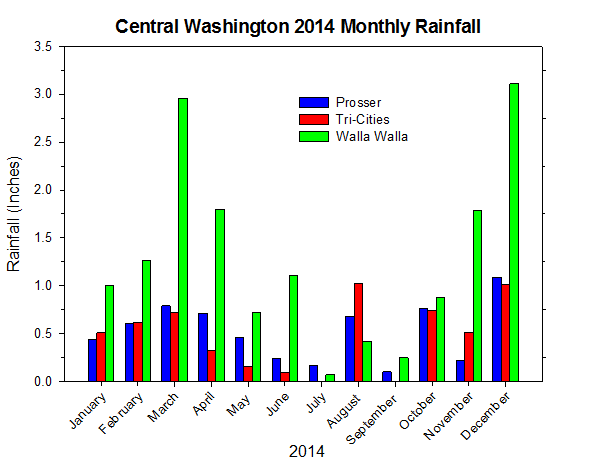 July was Prosser's all-time hottest month, which was followed by record warm months in August and October. Overall, the summer season was the hottest on record, while October was the most significantly above normal temperature month in five years. Highlights from this toasty time include a high of 109 degrees at Tri-Cities on July 16th, a low of 84 degrees at Wahluke Slope on July 13th, and a high of 92 degrees at Mabton East on October 6th. 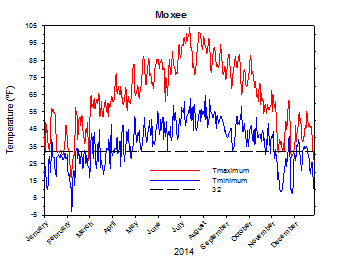 Interestingly, however, there were also several interludes of brief but intense cold in 2014. This fact is a testament to how warm the rest of year had to be in order to claim the top spot from 1992. In early February, an arctic outbreak led to several days of bitter cold and areas of heavy snowfall in eastern Washington. Prosser experienced their coldest February temperature since 1996, and also the overall coldest month of February since 1996. 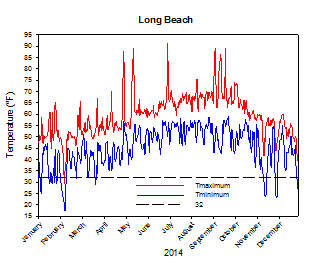 Oddly, February was actually slightly colder than the mild January of 2014. Again in mid November, an arctic blast sent temperatures tumbling into the 20s for highs and teens for lows in eastern areas. Several days earlier, many of these same areas had been unseasonably warm in the 60s and low 70s. 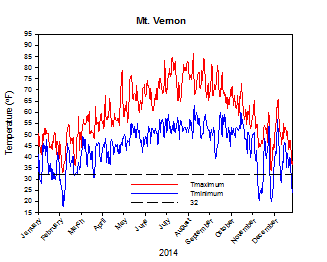 Interestingly, the mean monthly low was cooler in November than in December. 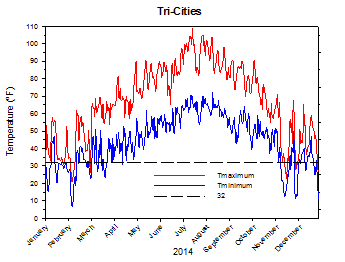 Thus, despite two major arctic blasts that occurred unusually late and unusually early in their respective winter seasons, most of 2014 was remarkably warm. A rather mild January was followed by a cold February which featured an early month arctic blast. Stormy weather in the middle of February brought much needed snow to the mountains, along with rain to western areas and mild breezes for eastern areas. Although March began with cold temperatures, the remainder of the month and most of April was fairly mild. 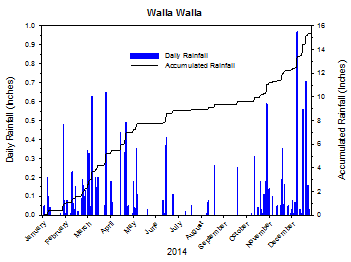 May and June were warmer than normal but generally uneventful months. 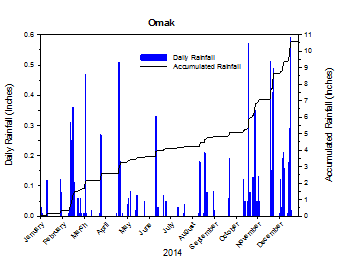 However, July and August were characterized by extreme heat. July was the hottest month on record, and was followed by the warmest August on record. On July 13th, the low temperature at Wahluke Slope was 84 degrees, while the high at Tri-Cities reached 109 degrees on the 16th. 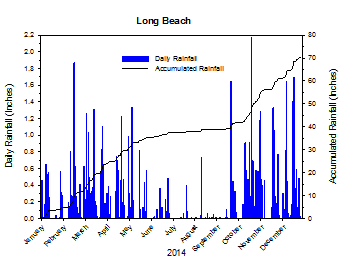 September was a warm yet generally non-descript month. October, however, was a month for the record books. The high temperature at Mabton East reached 92 degrees on the 6th, and several locations reported record October heat. Hot day-time temperatures early in the month were replaced by mild night-time temperatures later in October, as the weather became wetter and more active. 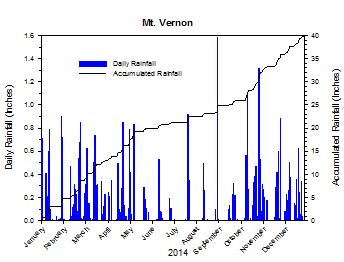 Overall, monthly temperatures were well above normal. 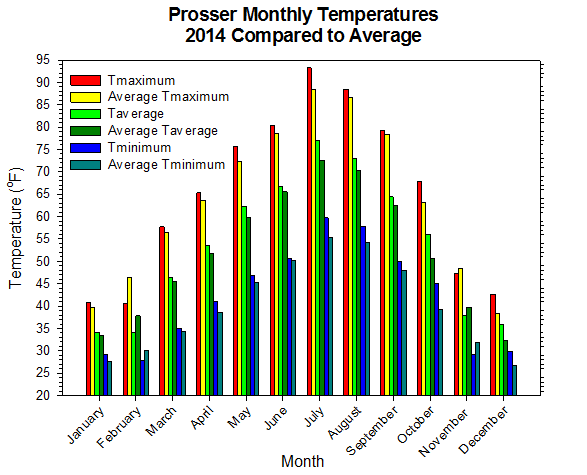 In fact, Prosser experienced the greatest monthly temperature departure from normal in nearly five years. However, a major pattern change in mid November sent temperatures tumbling to well below normal values for more than a week. Highs and lows in eastern Washington fell from the 60s and 40s to the 20s and teens in only a few days. Still, the pattern quickly reverted back to abnormal warmth for much of the remainder of the year. 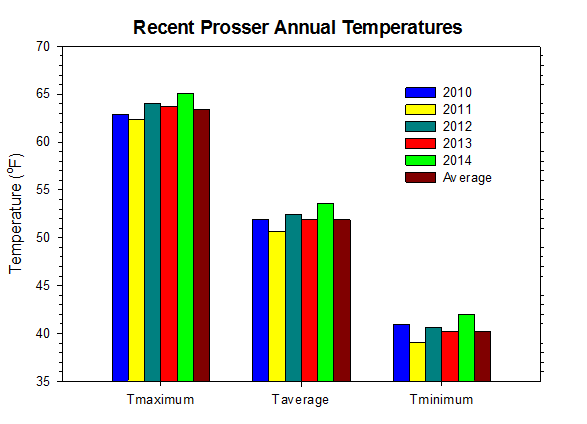 The 2014 average temperature at Prosser (WSU IAREC) was 53.6 degrees, which is 1.7 degrees above average. The average high temperature was 65.1 degrees, which is 1.7 degrees above average. The average low temperature was 42.0, which is 1.8 degrees above average. 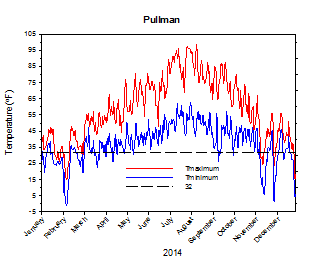 The average 8" soil temperature was 56.2 degrees. 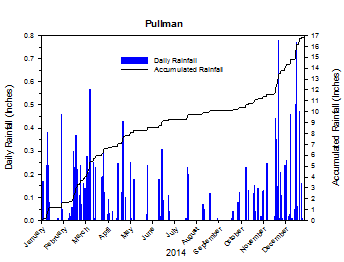 6.27 inches of precipitation fell during the year, and the average wind speed was 4.6 mph. The warmest temperature of the year was 103.9°F on July 16th, while the coolest high was 16.1°F on February 6th. The warmest low temperature was 66.6°F on August 12th, while the coldest temperature of the year was 1.3°F on February 7th. The warmest day of the year was July 16th, with an average temperature of 84.9°F, while the coldest day of the year was February 6th at 12.9°F. The coldest month of the year was February, with an average of 34.1°F, while the warmest month of the year was July, with an average of 77.1°F. 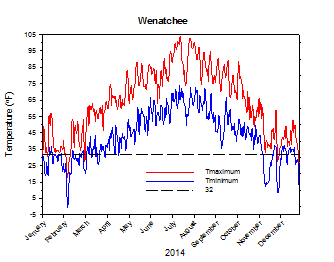 The average 2014 high and low temperatures at Wenatchee were 64.2°F and 42.8°F. February 5th: The temperature at St. Andrews plunged to -11 degrees. March 1st: The high temperature at Green Bluff (near Spokane) was a chilly 19 degrees. July 13th: The low temperature at Wahluke Slope was a sultry 84 degrees. 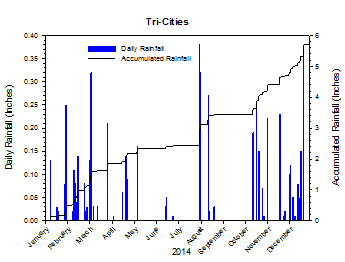 July 16th: The temperature at Tri-Cities peaked at 109 degrees. 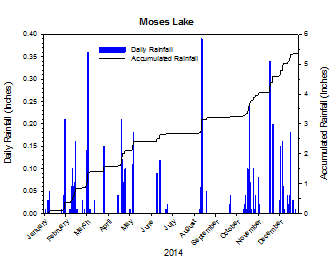 August 14th: 1.5 inches of rain fell at Boyd District. October 6th: The temperature at Mabton East soared to 92 degrees. November 12th: The temperature at Anatone fell to 3 degrees. November 18th: The high temperature at Tri-Cities was only 23 degrees. February: Cold beginning and stormy around mid month. 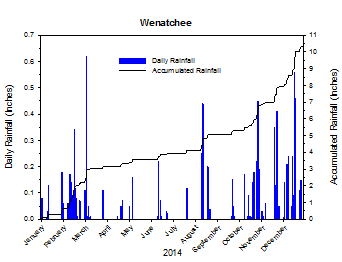 June: Warmer than normal and variable. July: Hottest month on record. August: Record heat with a few storms. October: Very warm and changeable. November: From warm to cold. Given the record-breaking growing season accumulated GDD values, the most significant agricultural concerns of 2014 were heat and water stress. 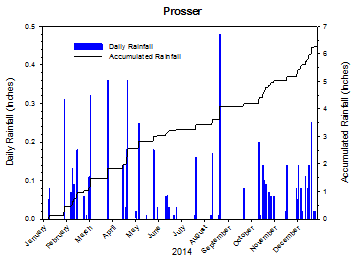 Most crops fared well last year, with good yield and quality reported in many cases. However, there were peach blocks which lost 60% of their crop to splitting that was caused by rapid, heat-induced growth. The massive Carton Complex fire in north central Washington damaged some orchards and wheat fields in July. Otherwise, the early season cold snap during mid November may have damaged some fruit trees due to the rapid change from warm to cold temperatures. 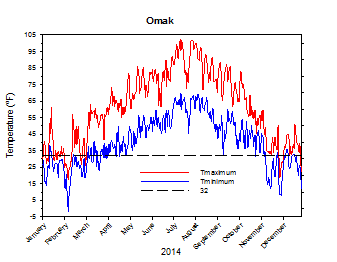 Luckily, the November 2014 cold event was not nearly as severe as the damage-causing arctic outbreaks that occurred in 1955 and 1985 (National Agricultural Statistics Service). 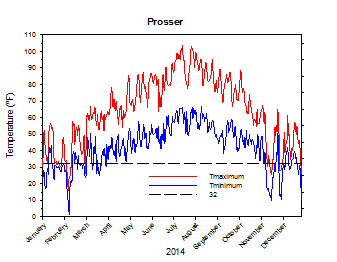 Prosser's annual mean temperature in 1992 was 53.5°F, which made it the warmest year on record until 2014. According to the Climate Prediction Center, above average temperatures and below average precipitation are favored for most of 2015. Weak El Niño conditions should continue through the first half of 2015, with uncertainty in the evolution of ENSO thereafter.